In some cultures in the Northern Hemisphere, the astronomical Vernal equinox (varying between 19 and 21 March) is taken to mark the first day of spring, and the Summer solstice (around 21 June) is taken as the first day of summer. I debated cropping off the bottom part of the photo, but I wanted you to see just how much snow we still have. Can you guess where I took this photo? 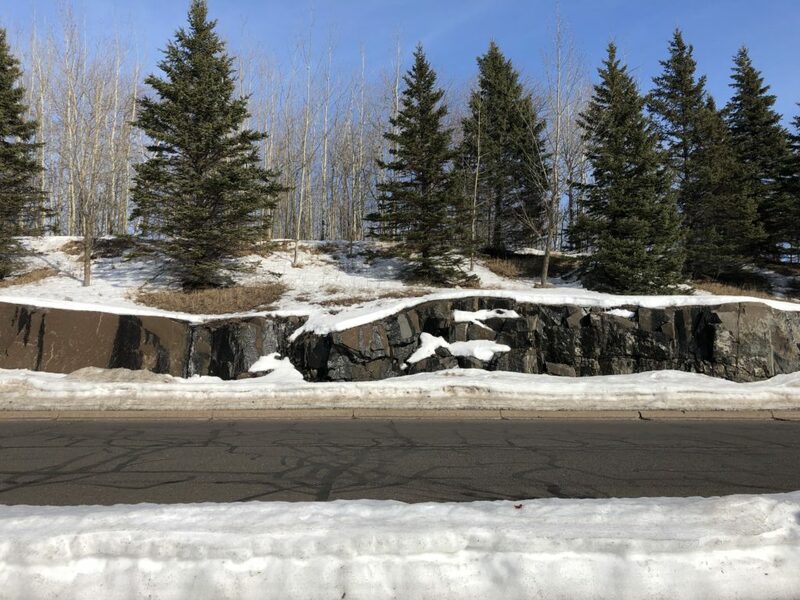 This is basalt rock. Read about the Duluth Complex here. Posted in Miller Hill Tagged basalt, road, rock, snow, tree. Thanks for the post, I enjoyed the link about the Duluth Complex, so interesting! You are always such a wealth of information! Looks like somewhere along Skyline Drive. Hi Michelle, I took this photo on Miller Hill, at one of the shopping centers.